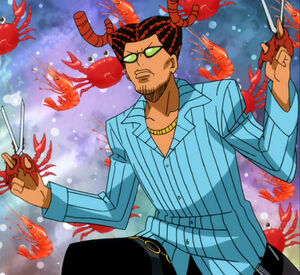 Appearance: Cancer dresses in a way reminiscent of a hairdresser, His hair is black and braided in red cornrows that end in a shape that resembles crab's pincers. Like Warren Rocko, he has thick lips. He always wears a blue striped shirt and dark trousers with two aquamarine stripes each side, also wearing boots in his feet. In his pants there's a ring chain in the right pocket and a hairdresser tools' bag in the left side of his belt. He wears a golden necklace and it's commonly seen with his two main weapons: Scissors. The color of his eyes is unknown because Cancer always wears sunglasses with green lens. He also has six crab legs that appear from his back. Personality: Cancer has a very "cool" personality, he isn't very emotional or hotheaded. Cancer says -ebi (shrimp) at the end of his sentences instead of -kani (Crab) like most would think he'd say.